The gorgeous sunny warm weather & the calendar screaming 'May' mean only one thing -- American TV network upfront presentations! It's Christmas for the TV industry, the time when good shows get renewed & bad ones get sent to archive heaven. I've been nervously awaiting ABC's announcement to see what was on their kill list. 'Ugly Betty' had been rumoured to be out of favour with ABC execs. Its recent removal from the Thursday night line-up, replacing it with the far lesser 'In the Motherhood' & 'Samantha Who' made this TV viewer livid, and it seems that I wasn't alone. Ratings for the replacement shows weren't good forcing ABC to eat crow & return 'Betty' back to her regular time slot earlier than originally planned. You can't keep a great show down -- and 'Ugly Betty' is by far one of the sassiest, sweetest shows on TV anywhere! 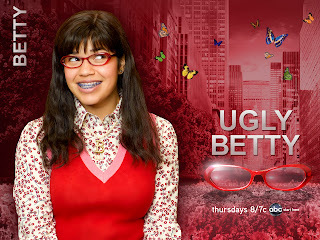 So it was a very HAPPY DAY to see that ABC in their wisdom has unveiled at their upfront that they've decided to renew 'Ugly Betty' for next Fall. GREAT news! Still...it's a head-scratcher to see they've *moved* the series from Thursdays at 8 to the TV wasteland of Fridays at 9pm. Are they trying to lose the audience that 'Betty' has faithfully collected over the past three seasons? Some people just don't realize when they have a good thing! At least 'Betty' will be back and the annoying and bland 'Samantha Who' won't be. Hopefully Christina Applegate can find another TV project that is more entertaining. She deserves as much. YAY - that means more Amanda the Receptionist too!! I took a break from Betty, but came back mid-season and glad I did. The finale was terrific and the writers are back on target. I will TiVO next season. My PVR had a fit and *didn't* record the finale! So I'm chasing it down on the web.... ABC.com won't allow us Canucks to view their eps over their website. Idiots! I hate geo-blocking!